Rooflights come with two main options for their glazing: glass or polycarbonate. To the inexperienced eye, they may look quite similar – from a distance. Closer up, glass rooflights and polycarbonate rooflights will serve different purposes and different types of customers. Glass rooflights are usually the preferred option for homeowners looking to achieve a better aesthetic and a more enjoyable way of life for themselves, in beautiful surroundings. • Fixed Glass Rooflights – modern and minimalistic, a flat glass rooflight will let in maximum amounts of daylight and look stunning in any setting. •	Roof lanterns/ pyramids – perfect for creating an architectural feature whilst giving beautiful, panoramic sky views overhead. • Manually Hinged and Electrically Hinged Glass Rooflights – choose a rooflight that offers quality glazing along with the option to ventilate your space. • Walk On – using strengthened double glazing, walk-on rooflights are suitable for pedestrian access whilst lighting up a space below. Is a premium option for your rooflights, giving you multiple benefits for your home. With spring just around the corner, now is the perfect time to invest in an aesthetically pleasing glass rooflight. •	It’s aesthetically pleasing. Sunlight streaming in through clear glass makes for a lovely, welcoming sight inside the home. •	You can enjoy reduced noise. When it rains, tends to be more noise proof than polycarbonate alternatives. It will create a better atmosphere inside the home. •	It’s thermally efficient. You can achieve very low u-values when you use double glazing. Don’t allow lots of heat to escape from your home. •	There are specialist glass options available. If you have specialist requirements, you can choose different types of glass, like coloured, toughened or self-cleaning. 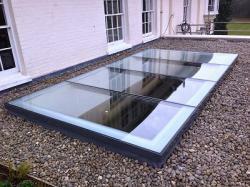 Need any more information regarding glass rooflights and the options available to you? Call 01276 451555 or e-mail info@nationaldomes.com and our team can help you.